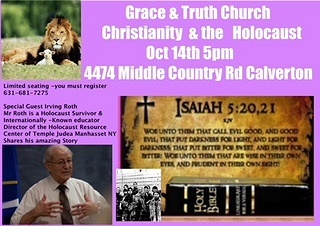 Subject: LongIsland.com - Your Name sent you Event details of "Christianity and the Holocaust"
Weekly Bible study on Christianity and the Holocaust. Meeting each Wednesday night at 7:30 pm at Grace and Truth Church, 4474 Middle Country Road, Calverton, at the Calverton Commons. Come and learn history and the powerful word of God given by Pastor Jim Lupis.